“Death begins in the colon.” – Most agree that statement comes from a Russian scientist, Élie Metchnikoff, who won The Nobel Prize in Physiology or Medicine 1908. If nothing else, it highlights (in a macabre fashion I admit) the importance of the gut, or second brain, which is dependent on microbiota. While most of the content herein is arguably outside the realm of my typical posts – when possible I try to respond to inbound requests. Specifically, the genesis of this series is because people have noted in various passing references the gut, its microbiota and its role related to health, I’ve been asked to expand on that topic. Flag areas that refer to microbiota and health issues, etc. Bonus resources! Highlight a few more esoteric sources for you. “The Personalized Medicine Revolution: How Diagnosing and Treating Disease Are About to Change Forever” ~ Pieter Cullis, Ph.D.
“The Gut Balance Revolution: Boost Your Metabolism, Restore Your Inner Ecology, and Lose the Weight for Good!” ~ Gerard E. Mullin, M.D. 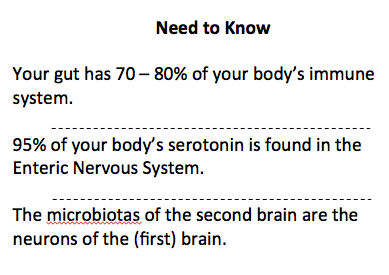 Here are some additional contexts for thinking about the gut/microbiota and health. I’ve extracted them from the named source and categorized to a small degree. I’ve only included a few for illustration. Physiology: There is ample (and growing) evidence of the role of microbiota in areas such as immune systems detoxification, inflammation, neurotransmitter genesis and vitamin production, nutrient absorption, satiety and metabolism including carbohydrates and fat. Behavior: You can alter behavior by exchanging (mice) gut microbiota. Scientists transplanted microbes from a timid group of mice into the guts of risk-taking mice and vice versa. The results saw the shy mice became outgoing, the brazen mice became apprehensive. Therapeutics: Researchers are exploring the treatment of anxiety, depression and autism through the gut. They believe drug delivery is easier to target in the gut than the brain. Your gut has 70 – 80% of your body’s immune system. Dietary fiber is broken into digestible short chain fatty acids by the gut. The gut even governs the normal functions of your immune system. About 50 percent of the dopamine (works in concert with serotonin) originates in the ENS. Vitamin production occurs in the ENS. Malfunctions of microbiota have been shown to lead to allergies, asthma, ADHD, cancer, diabetes or neurodegenerative conditions as well as autoimmune maladies. Certain bacteria are found in people with depression so Vagus Nerve Stimulation (VNS) could be used to treat depression. Inflammatory diseases related to microbiota include dementia, depression, inflammatory bowel disease (IBD) and toxic side effects of prescription drugs. 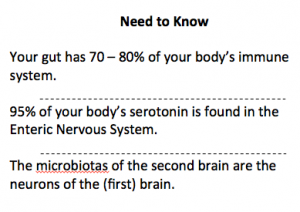 Gut bacteria can produce brain-derived neurotrophic factor (BDNF), gamma-amino butyric acid (GABA) and glutamate. GABA keeps the nervous system in a more stable state. Author’s Note: I have a very deep (personal) interest in the lives of children with special needs. I noticed a study conducted by scientists at the University of Pennsylvania that said stress to a mother during her first trimester of pregnancy changes her microbiome. It said “those changes are passed on to newborns during birth and are associated with differences in their gut microbiome as well as their brain development.” And that will have a lifetime effect on a child’s health and wellbeing. Autism Speaks, one of the leading advocacy programs, says “growing evidence links a dysfunction in this GABA (Gamma-amino butyric acid) system to aspects of autism.” I have also seen references to deficiencies in GABA, the brain’s top inhibitory neurotransmitter, causing ADHD. So please – use your first brain to protect your second brain. For anyone who wants to still dive deeper – here are some resources that have been useful for me. We have covered a lot in this series. And there is still more to uncover. I am not sure I’ve identified any magic bullet (or magic arrow) but I hope that so far in this series I have been able to point you to the target area.